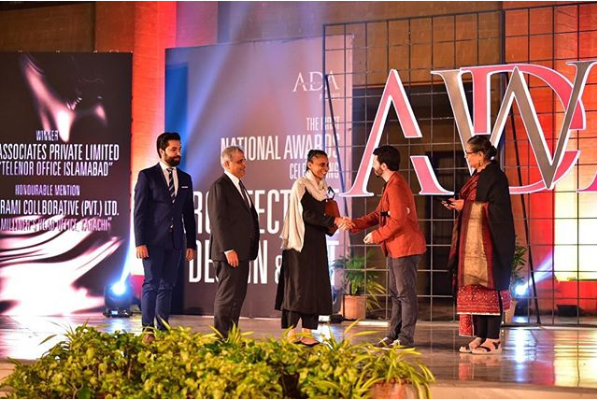 Telenor Pakistan headquarters ‘345’ has won the prestigious ‘ADA Award’ in the ‘Public Amenity Commercial Buildings’ category, adding another accolade to its long and growing list of recognition for its architecture. 345 champions green architecture as it’s built with rammed earth and features its own water conservation system with recycling and rainwater harvesting, a renewable energy mechanism that uses 230 KW of Solar Energy. The design is also highly energy efficient with active chilled beams, LED lights, thermal insulation, and occupancy sensors.